Undoubtedly, long wait-time experienced by airline passengers has been a matter of concern for airline companies. Longer the wait-time more is the frustration. Several passengers reach the airport terminal much earlier than their due time. The aim is always to make their way smoothly past security check-points. They prefer to not wear any pieces of jewelry, but there are many who miss their flights. Yes, some airlines have a robust passenger queue management system to decrease wait-time and offer a pleasant experience to their customers, but even then delays are there. They always look forward to finding a cost-effective way of decreasing the wait-time. Many airlines have even used displays for informing their passengers about approximate wait-time to ease their frustration. In such a scenario, Accura web SDK aptly decreases wait-time of airline passengers. The SDK is developed by Accura Technolabs, an R&D company with its focus on Computer Vision Technology for real-time and accurate text recognition. The company had also developed an OCR scanning app-Accurascan that accurately scans vital documents like ID cards, passports, visa, and US driving licenses. With an average recognition time of 500 seconds, the app accurately extracts information from the machine-readable zone of these documents. Thus, it can be of great benefit to establish the identification of passengers waiting for their turn in a queue. Accura web SDK, however, augment its scope of application for the fast check-in process. A web SDK allows authorized users to access a particular application. 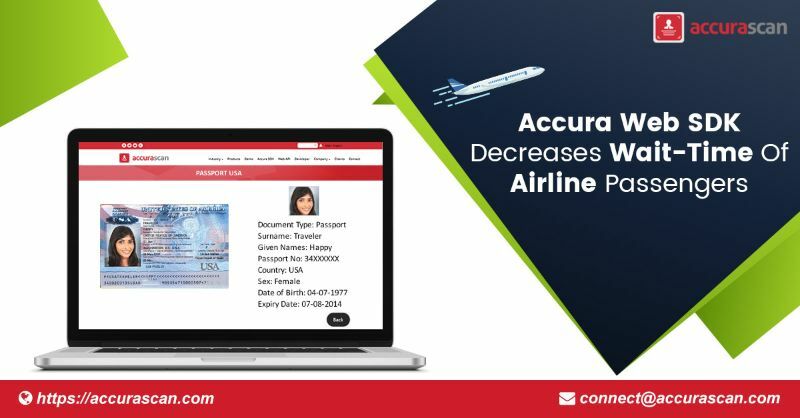 So, with Accura web SDK, airline officials at the counters can use the accurascan app to scan documents like passports, boarding passes, and national ID cards even on a web platform. In majority of airports, dedicated counters are there where airport officers or airline representatives validate the printed airline tickets and check passports with the aid of computers and scanners. So, having an OCR scanning app that accurately extracts the text along with the photograph of passengers from their passports at the counter itself proves a boon. Unlike scanning where a scanner creates a digital image from the actual document, Accura Web SDK allows the airline representatives to get vital details and image of the passenger within no time. Moreover, it also allows them to customize the Accurascan app as per their requirements which makes things much easier for airline representatives. Last but not least when airline representatives have the right tools in their hands for document checking and validation, wait-time of passengers would decrease considerably.